After facing tough competition from the young actors and Khans, Sunny slowed down in his career and is selective with his films. His last hit was Yamla Pagla Deewana in which the Deol family joined hands. Dharmendra, Sunny Deol and Bobby Deol played the lead roles in the movie. Though the makers have come up with the sequel, the movie has been rejected completely and it ended up as a debacle. After a debacle like Yamla Pagla Deewana 2, he is back with Singh Saab The Great and Dishkyaoon which too have been declared as debacles. 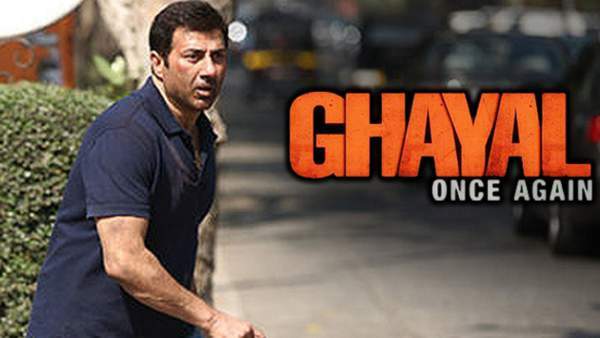 His last year outing I Love New Year too failed to impress the audience and after an year, Sunny Deol is back with Ghayal Once Again which is said to be the sequel for his 1990 super hit movie Ghayal. Ghayal will sure be remembered as a classic in the history of Bollywood and is one of the best films in the career of Sunny Deol. Sunny even stepped into direction with Ghayal Once Again and the movie has been made on a budget of Rs 35 crores. The film is said to be a thriller and is about a murder mystery. Sunny runs a secret agency and he helps the common man who is in problem. It is then a batch of youngsters approach him with the video of a murder which involves many celebrities. The rest of the movie is how Deol deals the situation and reveals the mystery. Ghayal Once Again released on February 5th and the flick opened with decent response all over. The movie collected Rs 7.2 crores on its first day which is decent. The talkie received mixed response from the audience all over and the collections dropped during the second day. Sunny Deol’s performance has been appreciated by the audience. The technical values of the movie and the direction has been completely outdated.